I had a few jobs to do around the house today, but they took an unexpected back seat to 911 cleaning time. I had to move the 911 out of the garage for a couple of hours on Thursday whilst I did some building work. During that time it rained and got covered in crap, so decided to wash it before putting the cover back on. Started on the inside as it was a bit dusty and had been a while since I cleaned the glass in the back. I'm no giant, but it's tight back there. Wiped down all the leather and plastics, then have it a good vacuum. Scrubs up alright. Washed the car and then found my misplaced Clay bar. Happy days, and thought, righto, might as well. The first time I clay barred the car, every panel was filthy. I generally do it every 6 months, but it's probably been a year this time. Interestingly, the left side of the car was worse than the right. I'm assuming as that's where most of the muck accumulates in wet weather. The smoothness of the paint when it's done right is rather addictive. 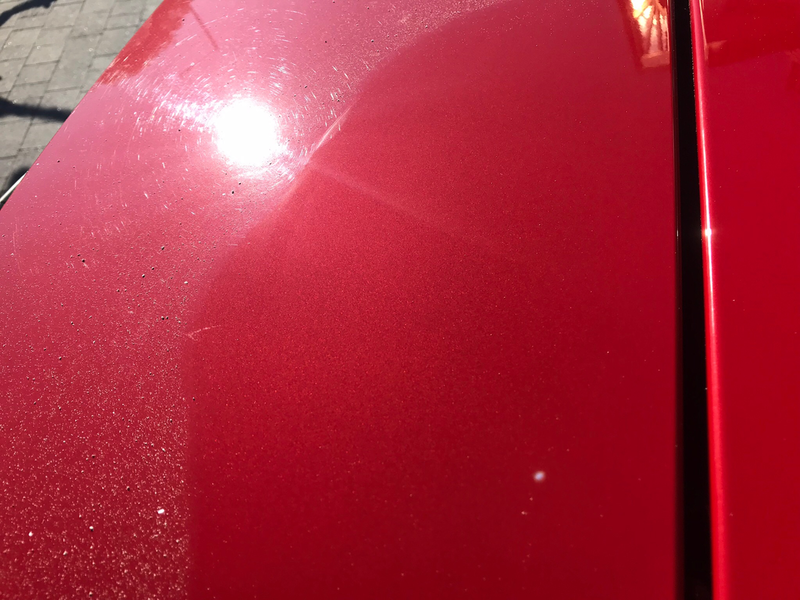 Makes the next stage of using the Autoglym Super resin polish significantly easier too. I finally used another product that makes the paint hydrophobic and super smooth. Not having a rear wiper, I use RainX on all the glass excluding the front. I don't like the chatter of the wiper when it's wearing thin, and you only know about it when it rains. Generally get home, say I'll do it later to only be annoyed the next time it rains when I haven't done it. I'd normally take a few pics, but in the dull grey light, on a silver car, it's futile. So its back on with the Porsche car cover and feel rather satisfied with my work. Now that I've done that job, next is to paint the disc hats and wheel bolts silver as they're not looking their best. Whilst the wheels are off I'd like to give the wheel wells a good clean. All done to the soundtrack of my fave tunes playlist. A rather nice way to spend a Sunday I say. 1. Car out of garage. 4. Car put back in garage. Perhaps you'd be better off with a 993. Did the driving on Sat Even had the pleasure of running into one Zingari and his new Italian. My car is far from a garage queen, although do enjoy giving it a good clean. Mate I've never used a DA. Always dine it by hand. Love to see the before and after when you've done yours. As for the pain, I remember being guided along the hammerite grey route as it's close to the original Porsche colour rather than a bright silver that are available. And what a surprise when you parked in that empty space behind me! I had to Google Janette, but she looks ideal. Always on the lookout out for some new sounds and interested to know whats on people Playlists? Theres some threads on here about it if you search. If someone can tell me how to export title and artist from a YouTube playlist, I'll bung it up here. I can only see how to publish the link. There are indeed Alex, and as a result of some of your previous recommendations I now have Benjamin Schoos amongst others on my playlist. But still always interested to here other peoples choices as I find its a good way to listen to tracks that I wouldn't normally choose. Yep - big Grace Jones fan. Larry Levan mix of pull up to the bumper is sublime.